From July to September 2016, we focus on the third Channel - the Prayer. Prayer is the lifeblood of Christian discipleship. Without a prayer life, we cannot hear God speaking to us and our hearts and minds will not be open to receive His love and mercy. The third Channel - Prayer - provides us with simple advice and practical steps for strengthening our relationship with God through daily prayers. Heavenly Father, we thank You for the gift of prayer. in being able to speak with You in prayer. Lord Jesus Christ, you have taught us to call God “Our Father”. Teach us each day to raise our minds and hearts to Him. teach us to cry out with our hearts, “Abba, Father”. and follow the voice of the Good Shepherd. so that we may remain faithful to our commitment to pray daily. The Prayer Channel is brought to you by the various prayer ministries. The Gospel often shows Jesus at prayer. In fact, all His life is a prayer because He is in a constant communion of love with His Father. Jesus is our great teacher and perfect role model in prayers. 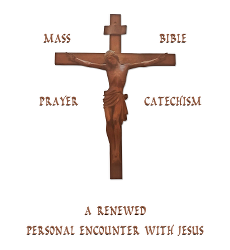 And read a summary of the Catechism of the Catholic Church on Prayer. We encourage you to say this prayer after watching the video. In this episode, we look at 4 prayers in our Catholic tradition. Whether it is praying with scripture, devotion or meditation, the essence of any prayer is encountering God. Try and see which one brings you closest to God and then pray it every day. Click the section headers below to know more about the 4 prayers and how to pray them. "From my youthful years (the Rosary) has held an important place in my spiritual life ... It has accompanied me in moments of joy and in moments of difficulty. To it I have entrusted any number of concerns; in it I have always found comfort." "Those who sincerely say 'Jesus, I trust in You' will find comfort in all their anxieties and fears." "... I would like in particular to recall and recommend the ancient tradition of Lectio divina: the diligent reading of Sacred Scripture accompanied by prayer brings about that intimate dialogue in which the person reading hears God who is speaking, and in praying, responds to him with trusting openness of heart." "Prayer for me is always a prayer full of memory, of recollection ...... And I ask myself: 'What have I done for Christ? What am I doing for Christ? What should I do for Christ?'" Holy Hour is a pious exercise of mental or vocal prayer, in union with the prayer of Our Lord in the Garden of Olives on Maundy Thursday night, when He was abandoned by the Apostles. It was taught as a practice to Saint Margaret Mary Alacoque by Our Lord Himself, who appeared to her in 1673, as she was in adoration before the Blessed Sacrament. Eucharistic Adoration is adoring or honouring the Eucharistic Presence of Christ. Jesus is truly present in the Blessed Sacrament - Body, Blood, Soul, and Divinity! We grow spiritually with each moment we spend with Jesus, as through our adoration, He calls us to a deeper personal relationship with Him. Join us for Holy Hour every month, or spend time in Eurcharistic Adoration in the Adoration Room. Click the section header below to read more on this week's topic. Why a HOLY HOUR before Jesus in the Blessed Sacrament? St. Thomas taught that the Eucharist is the greatest of miracles ever worked by Christ, to perpetuate his Passion and Sacrifice with us and to be specially present to each individual. Christ is present there for us, to manifest his great love for us. St. Thomas says: "He cares for us and is there.". If we care for him, we would also be there for a Holy Hour or some other form of Eucharistic adoration. Christ had asked this of St. Margaret Mary Alacoque as he had asked the apostles in the Garden of Olives: "Can you not watch one hour with me?". Vatican II insists that the Christian life is incomplete if it is not Eucharistic. In the Decree on Priests (No. 5) the Council wrote: "Every ministry of the Church and every work of the apostolate are linked with the Holy Eucharist and are directed to it.". Of course, this refers primarily to the Eucharistic sacrifice and the Council said so in the Dogmatic Constitution on the Church (No. 11): "Taking part in the Eucharistic sacrifice, which is the apex and fount of the whole Christian life, the faithful offer the Divine Victim to God and offer themselves with it.". However, it is in the Eucharist that Christians will find unity in Christ: "In the Sacrament of the Eucharistic Bread, the unity of all believers, who form one body in Christ (1 Cor. 10,17) is both expressed and brought about." (Consti. on the Church No. 3). To stress that this did not refer only to the Eucharistic Sacrifice and the reception of Holy Communion but also to Eucharistic adoration, Pope John XXIII, who called the Council, arranged for the canonization of Blessed Julian Eymard, the apostle of Eucharistic adoration, for the solemnities of the closing of the first session of the Council, that he was to be an example and model of true Catholic renewal. There is strength in numbers. Our Lord promises to be with us when we gather in His name (Matthew 18:20). Come and pray with us. Be part of our Prayer Communities and together let us "lift up our voice to God with one heart" (Acts 4:24). Click the section headers below to know more about our Prayer Communities and their prayer schedules. Siloam meets every Monday at 8pm to praise, worship and glorify God and for fellowship with each other. Through teaching from our own members and invited speakers, religious & laity, members build up their faith & knowledge of the Word of God. The Siloam Intercessory group helps to bridge the gap between God and His people through fervent prayers. Siloam organises the Life in the Spirit Seminar that helps Catholics renew their faith through the power of the Holy Spirit. Siloam undertakes its mission of evangelization using the gifts of the Spirit. All are welcome to join Siloam! Click here to find out more about Siloam. The Divine Mercy Prayer Group meets every Friday at 3pm in the Adoration room to pray the Divine Mercy chaplet and to offer intercessory prayers for intentions received from parishioners. As a member of the Archdiocesan Divine Mercy Apostolate (ADMA), this prayer group participates in ADMA retreats, Divine Mercy Sunday and St. Faustina Feast Day activities. Also find out more about Divine Mercy Devotion and how to pray the Divine Mercy Chaplet in Episode 2. The Intercessory Prayer Group meets every last Thursday of the month to intercede for the intentions of the Church, our Holy Father & Bishops, our priests, parish families and the needs of the world. Each session starts with ADORATION of our Lord in the Blessed Sacrament, acknowledging His presence and giving Him honour and glory. 2nd is CONTRITION: Humbly kneeling before the Lord, recognising our sinfulness, repenting and pleading for mercy; beseeching God to forgive our sins, those of our families, our Church and the sins of the world at large; praying for true contrition and a genuine desire to change our ways. 3rd is SUPPLICATION: The prayer leader presents various prayer intentions and lead the intercession for each of them. Lastly, ending with THANKSGIVING in songs and prayers for blessings received. The Divine Office is known as the Liturgy of the Hours and is the richest single prayer resource of the Catholic Church, with prayers, psalms and readings for each of the Hours, changing each day and through the seasons and is the official prayer of the community of the Church. The liturgy of the hours, like other liturgical services, is not a private matter, but belongs to the whole Body of the Church. Morning Prayer – known as Lauds – to sanctify the morning. Evening Prayer – known as Vespers – to give thanks for the blessings of the day. The Divine Office Group prays the Morning Prayer – Lauds – the purpose of the Morning prayer is to sanctify the morning. Celebrated as it is as the light of a new day is dawning, this hour also recalls the resurrection of the Lord Jesus, the true light enlightening all people. Fellowship gatherings are organised from time to time. All are welcome to come and join the group. Every Monday to Saturday, at 6:20 am (before the daily 7am Mass), the Divine Office Group prays the Rosary at our Lady's Statute in the main church. A Rosary Devotion is held on the 13th of every month at The Grotto. Rosary prayers are also offered before every weekend Mass in May and October. Also find out more about Rosary Devotion and how to pray the Rosary in Episode 2. The Bereavement Ministry consoles and comforts the bereaved in their grief. We lead prayers for the faithful departed at funeral wakes and help out at funeral masses. Join the Bereavement Ministry to support our parish community in their times of sorrow and grief. Click here to see when the various prayer groups meet. You're most welcome to join them.